Patients with frozen shoulder will feel shoulder pain and joint stiffness as a result of restricted joint capsule movement, caused by inflammation and the development of scar tissue within the shoulder. For more information about treating this condition, schedule an appointment with Dr. DuBois to discuss the available conservative and surgical treatment options. Frozen shoulder, also known as adhesive capsulitis, refers to a musculoskeletal condition that causes pain and reduces upper arm range of motion. This condition is caused by a restricted joint capsule, which is a set of ligaments that surround the shoulder joint and keep the bones in place. Through repetitive use or traumatic injury, scarring, thickening, or shrinkage of the joint capsule can occur, making movement difficult and painful. As a ball-and-socket joint, the shoulder enjoys a wide range of motion through rotation of the upper arm. The main shoulder joint, known as the "glenohumeral joint," is comprised of the humerus (upper arm bone) and the scapula (shoulder blade). The rounded head of the humerus fits within a shallow socket on the scapula called the glenoid fossa. A set of strong connective ligaments (called the shoulder capsule) surrounds the ball-and-socket joint and helps hold the bones together in the proper position. In patients with adhesive capsulitis, the joint capsule's movement becomes restricted, causing pain and inflammation while limiting the shoulder's range of motion. The shoulder may develop increased pain with additional use, and makes sleeping uncomfortable. As the joint capsule becomes restricted, movement becomes more and more painful. The joint capsule develops scar tissue, further restricting the movement of ligaments and increasing the associated pain. The condition is often a result of previous shoulder injuries, such as tendinitis, bursitis, or rotator cuff damage. By measuring the patient's range of motion, an attending shoulder surgeon can diagnose frozen shoulder during an examination. Additional imaging, such as X-ray contrast dying or an MRI (magnetic resonance imaging) scan, may be necessary to confirm the presence of a shrunken shoulder capsule. Because frozen shoulder can become a permanent condition, treatment tends to be aggressive. Treatments usually involve a variety of different conservative treatments, including physical therapy, cortisone injections, and anti-inflammatory medications. Patients should avoid heavy lifting or sudden motions during the rehabilitation and recovery phase to reduce the risk of re-injuring shoulder tissue. In some cases, adhesive capsulitis may be resistant to the conservative treatments described above. In these cases, patients may benefit from arthroscopic surgery to remove scar tissue that has built up around the shoulder. This procedure stretches and releases the stiffened joint capsule, potentially restoring the shoulder's range of motion. 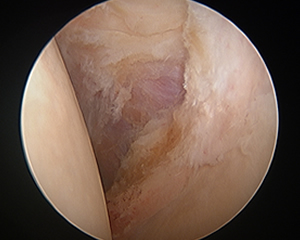 Arthroscopy is minimally invasive, and uses fiber-optics to reduce the amount of muscle and tissue tampering during surgery. 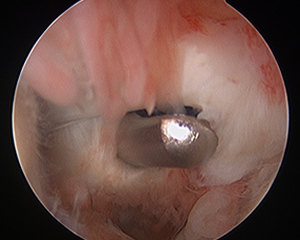 During an arthroscopic procedure, the surgeon will first make a small incision to insert the arthroscope, a small fiber-optic camera that sends real-time images to a monitor in the operating room. Through a second incision on the shoulder, the surgeon will insert the operating instruments, roughly pencil-sized, to perform the joint capsule release. Though recovery times vary, some patients may complete rehabilitation within six weeks. Dr. Benjamin DuBois is one of San Diego's leading shoulder surgeons, dedicated to the treatment of shoulder disorders in a comfortable and safe environment. As a board-certified and fellowship-trained orthopedic surgeon, Dr. DuBois has extensive experience performing minimally invasive surgical procedures, including arthroscopic surgery, to treat conditions including frozen shoulder, rotator cuff damage, and shoulder labrum tears. For more information about treatment options for frozen shoulder, schedule an appointment to speak with Dr. DuBois at his La Mesa office.